People are becoming more aware of the type of foods they put into their bodies, especially when it comes to animal products. Many in society have discovered that becoming vegan is not only a healthier way to live but it’s kinder to animals and to our planet’s future. But becoming a vegan can have its challenges. While eliminating meat and animal products from your diet can have its health benefits, there will be some nutritional essentials you’ll be lacking such as protein. Insufficient protein can cause muscle cramps, weakness, and soreness which can cause muscle atrophy over time. A healthy amount of protein induces lean body mass, muscle strength, and function. Vegans will need to take a supplement that will help their bodies absorb their daily protein allowance. You can take a protein powder but most protein supplements are not vegan which will be counterproductive to what you want to achieve. We may have the answer. If you’re looking for a vegan protein supplement that will give you a healthy dose of protein Vega Protein and Greens can provide you with the right amount you need daily. Read on to learn more. What is Vega Protein and Greens? 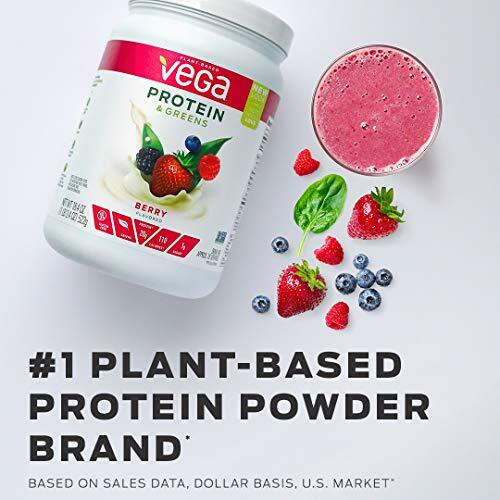 Vega Protein and Greens is a plant-based vegan powdered supplement that gives you a healthy dose of protein per serving. You can mix the protein powder in a glass of water, almond milk or any vegan based drinkable liquid to ingest it. How Much Protein Does it Contain? You will get a dose of 20 grams of plant-based protein per serving. When you double this up you will get your daily protein requirement for your body. If you mix Vega Protein and Greens with water the calories per serving are 110 to 120. Usually, people on strict diets don’t have to worry as these are healthy calories to consume and will not make you gain additional weight. Vega Protein and Greens provide you with many essential nutrients such as amino acids. You’ll also get a healthy dose of vitamin A, vitamin C, calcium and iron with every serving. There are no added preservatives, saturated fats or Trans fats. 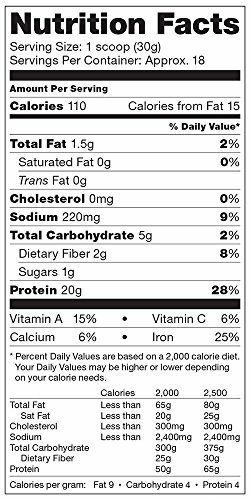 There’s only 1g of sugar but you’ll also get 1g of dietary fiber and 270mg of Sodium per serving. What Types of Protein are in Vega Protein? Vega Protein and Greens is made up of a blend of plant-based proteins such as pea protein, brown rice protein & sacha inchi protein. Sacha Inchi protein is extracted from the sacha inchi plant also known as Sacha peanut, mountain peanut or Inca-peanut. The plant is grown mostly in parts of South America and some parts of the Caribbean islands. The sacha inchi is a superfood seed loaded with protein and rich in Omega 3 & Omega 6 fatty acids. The Omega fatty acids in sacha inchi seeds are actually more than what you get from salmon. What Veggies and Greens Are in The Blend? If you battle to eat your veggies every night because you don’t like the taste, the Vega protein shake will help you ingest the necessary nutrients effortlessly. You’ll get all your healthy greens in every serving such as organic alfalfa, spinach, broccoli, and kale. Does Vega Protein and Greens Help with Weight Loss? The Vega protein shake shouldn’t be used as a meal replacement. But with the correct exercise and diet, Vega protein & greens can help you lose weight. Incorporating the shake into your diet can also assist you in gaining muscle mass when you do weight lifting. Is it Difficult to Mix? The Vega Protein and Greens is essentially a powder & when the powder is mixed with a liquid it can create lumps. To mix the shake, it’s advised you use a blender so that the liquid and the powder combine properly. If you don’t have a blender, use a handheld whisk to get the lumps out. Being vegan doesn’t mean you have to eat tasteless food or drink bland beverages. 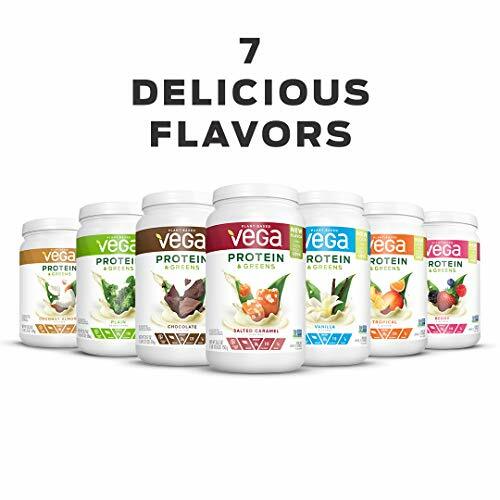 Vega Protein and Greens provides you with all the flavors you love so you can enjoy your protein shake as if you’re having dessert with every meal you have. Where Can You Buy Vega Protein and Greens? You’re able to buy Vega Protein and Greens from many independent distributors & various sites online such as Amazon. Check your local health stores as they may stock this product depending on where you live. Many people believe that vegan food is bland and tasteless but living a healthy animal cruelty-free life is actually the opposite. There are many foods and beverages that taste amazing & you’ll be able to cater to a cause that can potentially save the planet. Products like Vega Protein and Greens are important to have on the market. It’s a way to teach people that being vegan isn’t an unhealthy lifestyle. Vegan based products like these can potentially provide you with more nutrients than animal products can. If you follow a vegan diet and you want to supplement your protein intake, Vega protein & greens will play a role of providing you with your daily protein allowance. Vega Protein and Greens gives you energy, lowers the effects of muscle fatigue & helps you gain muscle mass when you exercise. With no added artificial coloring and no added preservatives, you gain the results & performance you need in life. If it’s a healthy nutritional cruelty-free life you want, you now know how to make it happen.